Lovejoy ISD currently has three Elementary Schools: Puster Elementary, Lovejoy Elementary, and Hart Elementary. 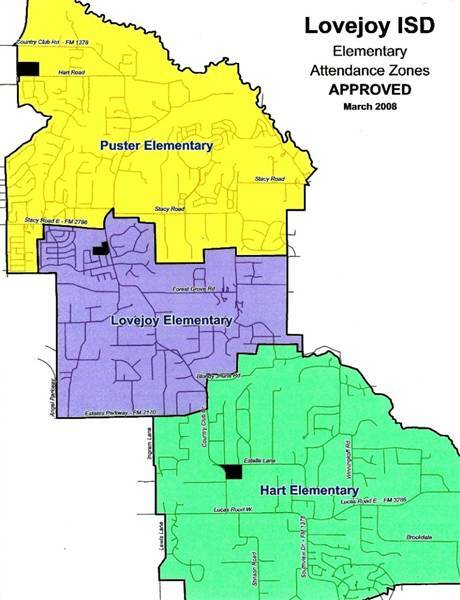 See the elementary attendance zones map below that was approved in March of 2008 to determine if the property or home you are considering purchasing is within the elementary school boundaries of your preferred school. There is a printable copy if you click on the Lovejoy ISD Elementary Attendance Zone link below. The Lovejoy Independent School District Map below shows the locations, addresses, and main telephone numbers of all schools in the Lovejoy District, and also includes the locations of future school sites. Lovejoy ISD currently has three elementary schools, one middle school, and one high school. There is a printable copy if you click on the Lovejoy Independent School District Map below. For more information about the future schools, contact the Lovejoy Independent School District. All information is subject to change, and subject to verification by purchasers, home owners or other interested parties. Jeanie Elliott, Inc. REALTORS advises all interested parties to verify all school information with Lovejoy ISD prior to entering into a purchase contract, and does not guarantee the information on these maps that is available on our website or their accuracy as to being the most current.